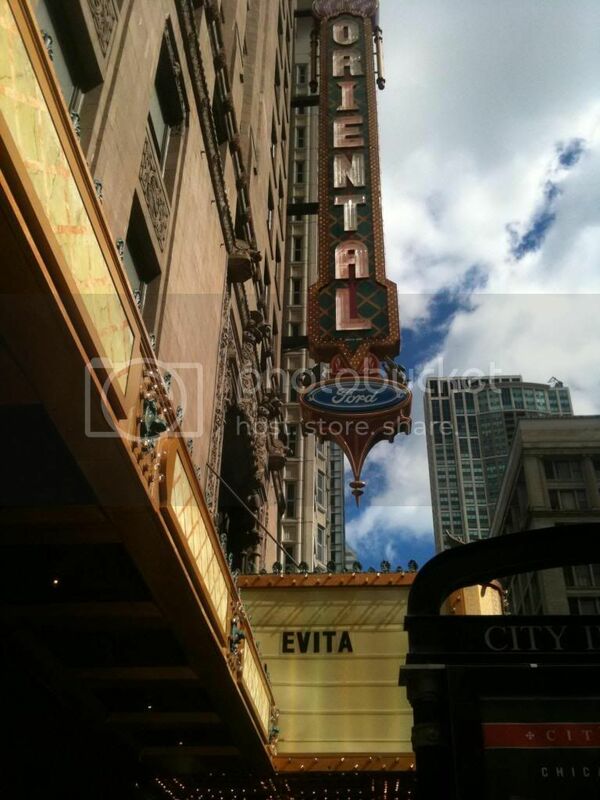 This past weekend, I saw the musical "Evita" on Broadway here in Chicago. It was very entertaining. Definitely I highly recommend this for those who love musicals/plays. Dr. Dayriz and I all ecstatic. Dayriz is a graduate of La Salle College of Medicine in the Philippines. She is a practicing Internist in Chicago. She's also , like myself, fond of plays and musicals. super cool in my book. My two favorite ladies at work. Dr. Dayriz and Dr. Maria. Dr. Maria is the head of the Department of Pediatrics in a major hospital in Chicago. She's such a lovely and wonderful physician,..and lady. A mother-figure in the hospital to me. 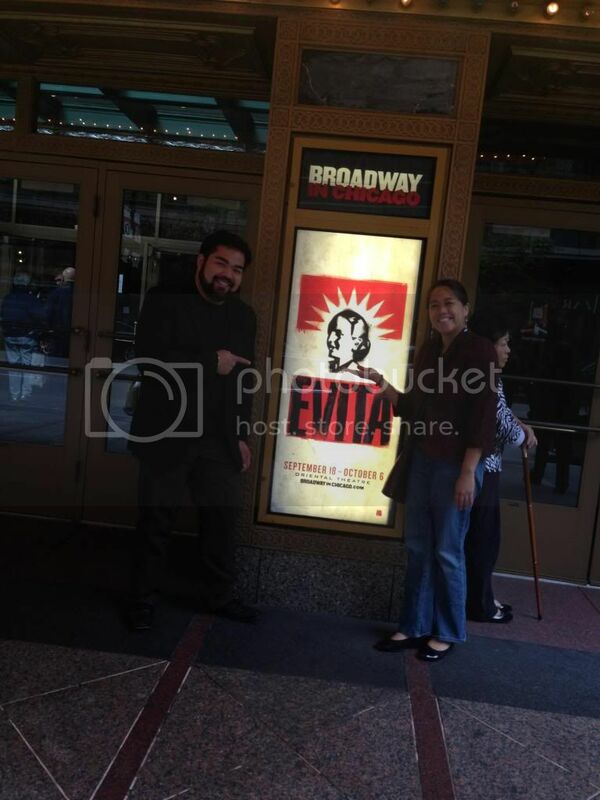 Next time we're going to watch "Bewitched", which is scheduled to play on January - February of 2014.
years ago... told the banana republic i can't be in new york without going to broadway. had wanted to watch "the music man" at that time (for the songs, naturally, like "till there was you" and "76 trombones"). no luck with the tickets. we went to "les miserables" instead. no regrets. oh yes, you're right. les misables was and is my all time favorite. you and your husband have excellent taste on plays. ps. who's your fav. character in les mis? jean valjean of course, and eponine. they're round characters. cosette and marius are too flat and uninteresting. aha! she's my favorite character as well. when she sings "on my own", the hairs on my back rise. beautiful , truly. thanks. gave me goosebumps too. 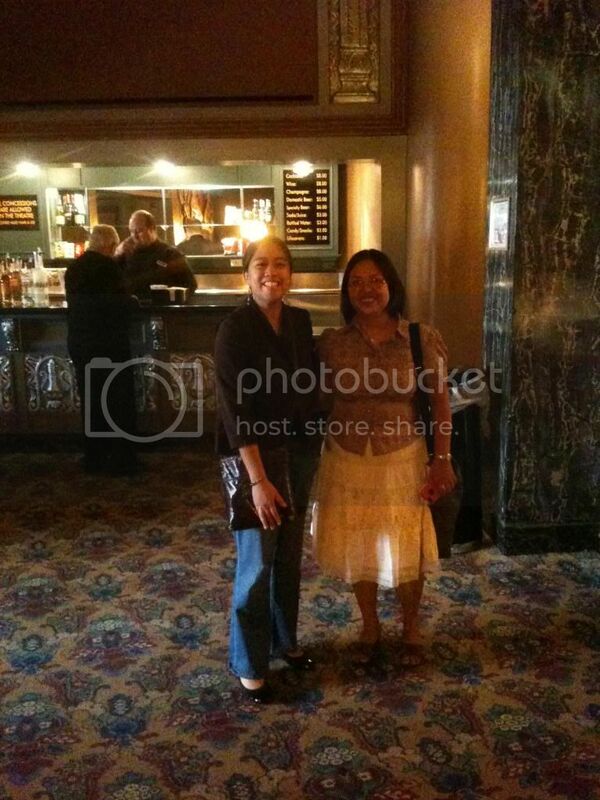 the les miz i watched on broadway at that time had an asian for eponine. terrific. was it the incredible lea salonga? no. someone i didn't know and whose name i missed. sorry, i don't go for leah salonga much. too arrogant. such a diva. really? i never knew that she was like that. you know this thing, the stance one makes when they believe they've become an "international star" with a few appearances in london and new york that were not sustained anyway, obviously because of limited roles for her kind. then they take plane rides and make the mistake of demanding, or expecting, to be treated differently from the rest of humanity. oh, well, maybe she was just misunderstood. wowzers wowzers! really? well i hope that she's really not like that , or that she practices a little more humility. sadly i never got to see her perform on stage, but after i saw the les mis play last year (november 2012), i left the performance totally awed at the storyline and the performance. then i youtoubed some songs, and lo and behold i was able to hear lea salonga's version of "on my own" and wow. my jaw dropped in reaction to her voice. that and the time she was younger, and cuter as well. hahaha. it added to the beauty of her voice. lea salonga as eponine singing "on my own"